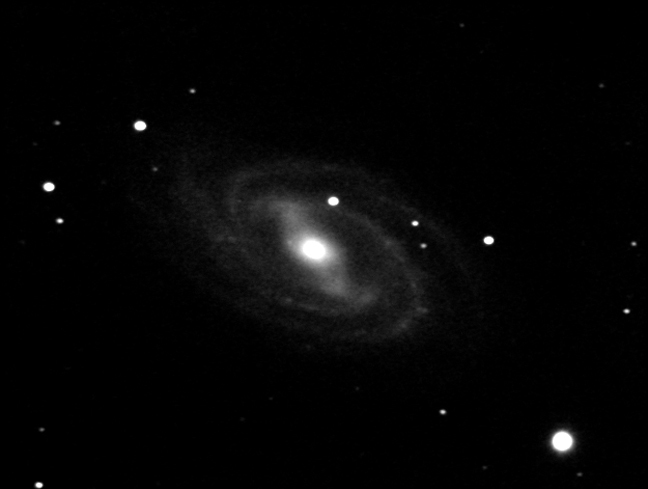 M109 is one of the "Theta"-like barred spirals, which appears as a "hazy spot" situated just 40' SE of the mag 2.44 star Gamma Ursae Majoris (Phad, or Phecda). M109 is about 7-by-4 arc minutes in angular extent, and of apparent visual magnitude 9.5 or 9.6. Visually, only its bright central region together with the bar can be seen, and appear pear-shaped in smaller telescopes, "with a strong suspicion of a granular texture" (Mallas).